Fish is good mood food and makes you more intelligent than those who don’t eat it. That’s my official line on the subject! This is a really easy salad and is as light as a feather, it also has pretty much everything you need nutritionally – Carbs, Fats, Proteins etc. You can build it up with whatever you prefer but I’ve keep this one real simple. This brilliant with good home made bread and freezing cold white wine. Get artsy fartsy with the arrangement here as it looks impressive – scatter the spinach on a big white charger plate, arrange slices of the tomato in a circle on top of the spinach, then the same with the red onion slices. Make your potato salad with the home made mayo and finely diced red onion. The addition of finely chopped parsley really sets this all off. 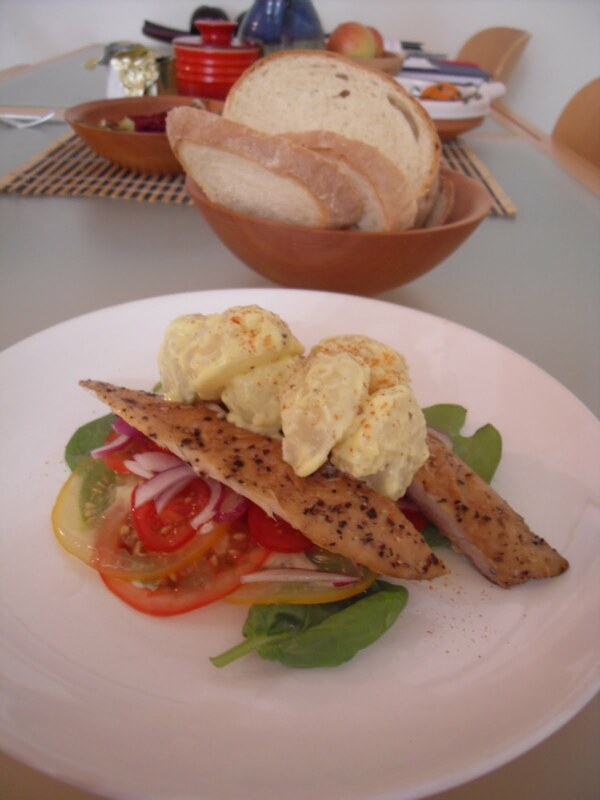 To finish the dish, arrange the fish on top of the spinach, tomatoes and red onion the top with the potato salad.